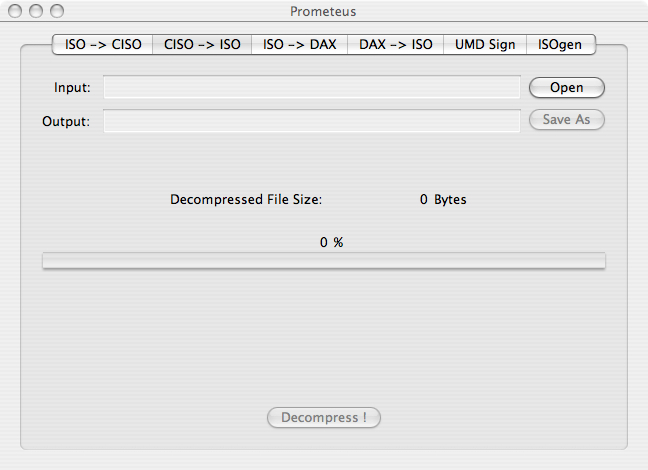 Using Prometeus (MacCISO-DAX) to compress 1.6G ISO image to CISO file on Mac OS X. MACISO supporte maintenant la compression/d'compression des ISO au format DAX en plus du CSO. If you run across any problems feel free to contact Dago~WATT; contact details can be found in the ReadMe.txt file. Dago WATT has released a quick bug fix update for Prometeus (MacCISO-DAX) . The bug occurred when attempting to use space in the directory/file path. Prometeus for Mac (MacCISO-DAX) can compress/converter ISO image to CISO file. ...... 8B now includes support for ISOgen. This means you're able to extract & delete/replace files from any standard ISO image, as well as rebuild your own PSP compliant image through an easy-to-use graphical interface. All on your Mac! If you run across any problems feel free to contact Dago WATT; contact details can be found in the ReadMe.txt file. Qweas is providing links to Prometeus (MacCISO-DAX) 0.81B for Mac as a courtesy, and makes no representations regarding Prometeus (MacCISO-DAX) or any other applications or any information related thereto. Any questions, complaints or claims regarding this application Prometeus (MacCISO-DAX) 0.81B for Mac must be directed to the appropriate software vendor. You may click the publisher link of Prometeus (MacCISO-DAX) on the top of this page to get more details about the vendor.